I love to be outside in nature. There is so much wisdom about life that lies within a garden that it''s a great time to discuss with kids the life lessons that exist there. It's not my idea though - it's God's. Apparently, He loves gardens too. After all, Adam was placed in a garden and the first job of man was to be a gardener! Jesus conversed with God in the garden on His final night of freedom and He was buried and resurrected in a garden. Jesus describes Himself as the True Vine and refers to the Father as the Gardener. He conveyed to us principles and stories using the analogy of gardens. The parable of the sower, the vineyard owner, mustard seeds, vines, fruit, chaff, wheat, fading leaves, mighty oaks, shoots spreading out, watered gardens, cedars, olive trees and I'm sure there are more - those are off the top of my head as I write. God loves the beauty of nature - He created it and it brings Him glory. So what better way for our kids to see Him, then through a garden? Sarah and I picked it up over this past fall at the State Fair. They were giving them away for free to kids at that time. So we figured we would plant them this spring as a fun project together. We got on the website with the code that they give to you so you can register your project. They send you e-mail notifications regarding the steps that you should be taking with your plants. The website has video information with fun vegetable characters and games that educate about plants and gardening. While we followed the directions for starting our seeds, we made note of the different sizes and shapes of the seeds as we worked. We also decided that it would be cool to tape each seed to a sheet of paper and then write it's seed name on it. (We talked about the diversity of God's creation and the thought that He put into the making of every seed!) Then once it began to sprout, Sarah would write the date it sprouted beside it's seed. It was neat to see the different times each seed took to germinate and begin to push through the dirt. Each day Sarah would water and note any changes on her sheet. We are now getting ready to plant them into some pots and the garden (some of the vegetables are more spring -so I am going to use a pot on the porch for those, to control their heat/light exposure, as it gets HOT in NC in the summer and I don't think they would make it in the garden because we started late). 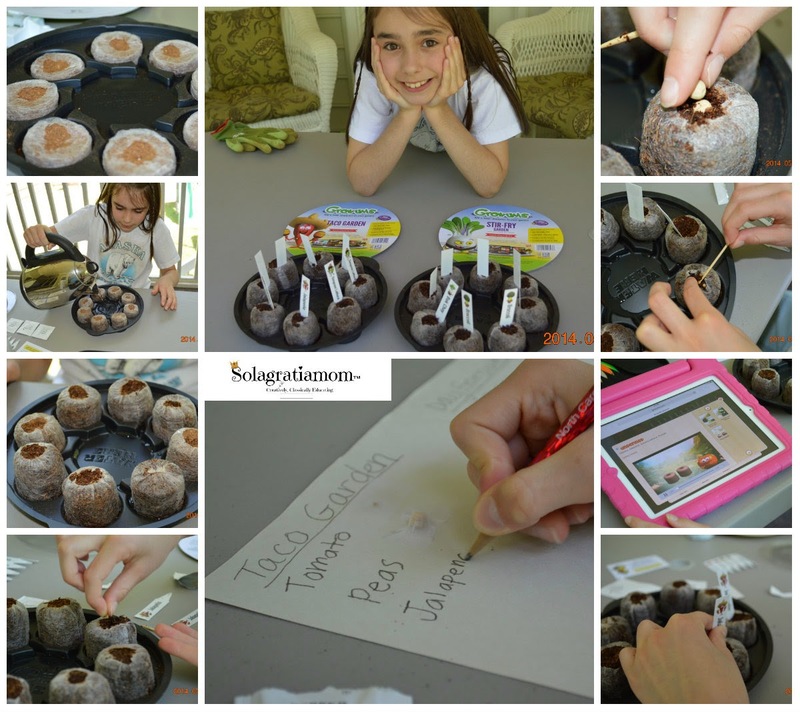 Even if you didn't want to plant them into a garden or do anything further with them once they sprouted, it's still a neat project and fun learning experience for the kids to do. The kits are inexpensive at $4 (plus shipping) on sale at Amazon. I recommend them for sure! I love the writing aspect - such a simple but important way to show kids that writing is a necessary part of life! Such a sweet idea to have a themed garden. Sarah looks very pleased with herself! There is so much rich imagery for teaching life lessons from a garden. I adore doing this stuff with the kids. Thanks for stopping by. Neat! I am slowly learning about gardening, both veggie and perennial gardening =) I am completely loving it, and yes there is so much for the kids to learn through the whole process!